Gout usually affects big toe, heel, ankle, elbow or wrist. It is a form of arthritis which is acute in onset. The gout attack occurs suddenly and passes away after a week or ten days. Severe pain, redness and swelling in joints are typical symptoms of gout. Gout occurs when uric acid level increases in blood. Increased uric acid level leads to formation of urate crystals which get deposited in joints and tissues. This process precipitate gout attack. Gout is more common in men than in women. It predominantly attacks males after puberty. In women, gout attacks usually occur after menopause. According to ayurveda acharyas gout is caused due to vitiation of Vata (vayu) and Rakta (blood). Vitiation of vata and rakta has been compared to the pairing of air and fire which is quick in onset and spreads quickly. The food we eat is broken down in our body into small molecules to help absorption of nutrients and excretion of waste. Uric acid is produced during break down of waste products called “purines”. Purines are nitrogenous compounds which are essential part of many foods and body tissues. Uric acid thus formed is usually filtered by kidneys. Excess formation of uric acid or its abnormal filtration leads to increased level of uric acid in blood. This eventually leads to gout. The gout attack starts from the joint which is at the base of big toe. Pain, swelling, redness, warmth and tenderness are symptoms of gout. These symptoms appear suddenly or acute in onset. 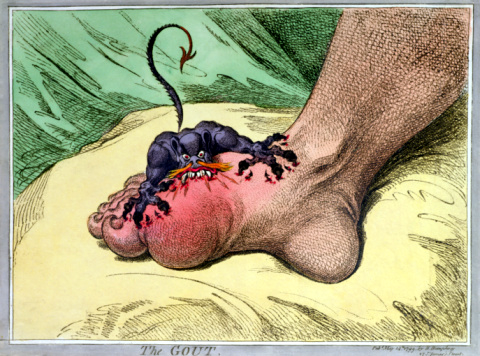 Even pulling a blanket on toe may hurt immensely in acute gout attack. The symptoms subside within few hours or days. The attack repeats for years. This may spread to other joints too. When gout becomes chronic uric acid crystals get deposited in the form of nodules (tophi) in soft tissues. These are commonly found around the fingers, at the tips of the elbows, in the ears and around the big toe. According to ayurveda texts of Charakacharya symptoms of gout are discoloration of joints, itching around affected area, pain and burning sensation around affected area. The pain at affected area will be intolerable with pricking and throbbing sensation. Consumption of red meat, sea foods in excess. Sleeping during day time and keeping awake at night. Accumulation of toxins in body. Working in extreme climatic conditons. The above facts vitiate both blood and vayu simultaneously and cause gout. Vegetables: cauliflower, asparagus, peas, spinach, contain a lot of purines, as do legumes such as lima beans, navy beans and lentils. Oatmeal is also high in purines. A very good article. It would have been helpful if the doctor wrote about its prevention and cure.